The Artisan & Artist ACAM 1000 camera bag is the second bag that I bought for my Leica gear, many years ago. I gave it away to someone, some years later. Although I liked the bag, it did not have enough space for non-photographic equipment that I always bring on a wedding. Some food, a backup harddisk, a bottle of deodorant, a beanie in winter, you’ll need some extra pockets for that. The Billingham 225 is my current bag of choice for weddings, but a Billingham Hadley Pro also does the job. The Leica M262 and complete range of Summarit lenses was delivered in an ACAM-1000 bag and this renewed my interest in the bag. Why, I hear you ask. Well, even with an almost complete range of Billingham bags in my office, there is one thing that no single Billingham bag offers: the best accessibility for rangefinder lenses ever. It looks like someone at Artisan & Artist designed the ACAM-1100 and thought: ‘We also need a bigger bag. Let’s just glue a very small box to this bag and call it ACAM-1000.” It probably didn’t go like that, but who cares, the ACAM-1000 is a unique bag. 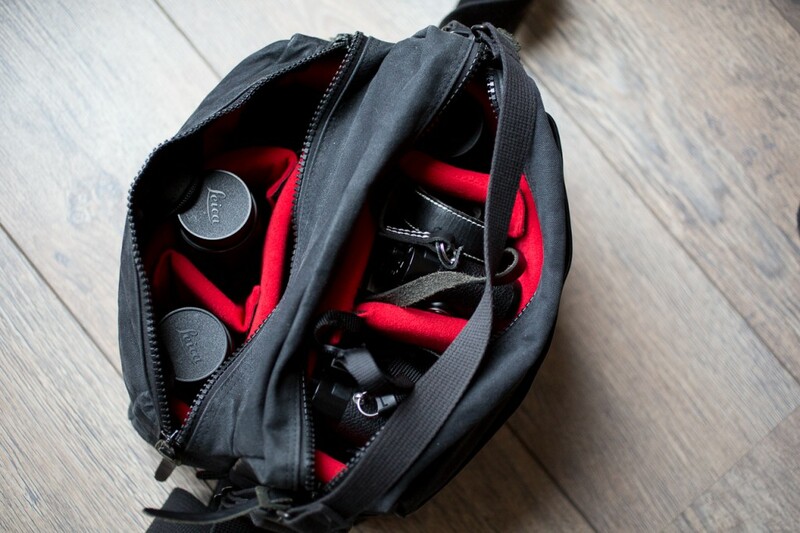 Most camera bags, if not all, feature lens pockets that are too deep for rangefinder lenses. The result: getting your lens out is harder than strictly necessary and if you bring more lenses than there are pockets, you’ll have to stack lenses. To me, stacking lenses is almost as annoying as getting a parking ticket. When you need to get a lens in a hurry – and on a wedding I’m always in a hurry – another lens on top of the lens that I need, makes matters complicated. With the ACAM-1000, it never was easier to get a lens out of the bag. And that alone is a good reason to buy this bag. The best feature of the bag: a place where you can put your rangefinder lenses, without losing them. Before you order, let’s talk some details. The ACAM-1000 is not only very, very accessible, it is also very lightweight. 840 Grams is about as light as it gets with this capacity. 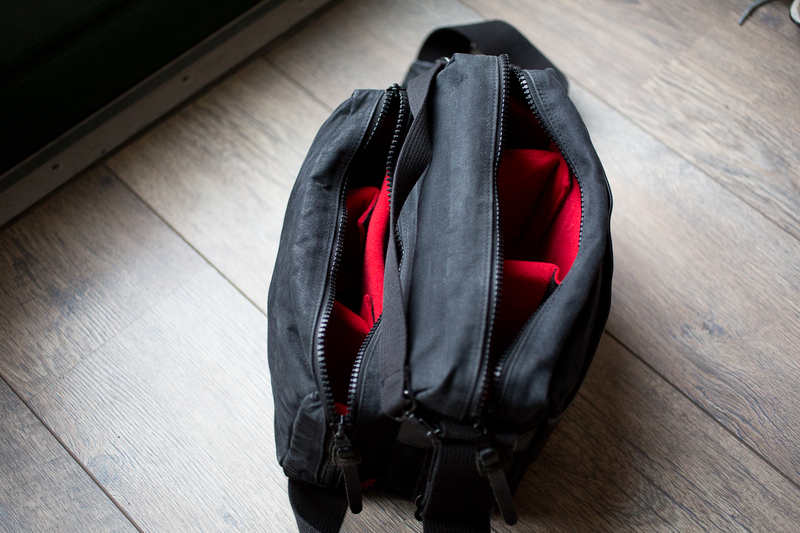 The outer material is made out of some kind of canvas (although there is probably also an synthetic component for durability), while is inside is generously filled with a removable padding. Your precious equipment is safe from mechanical impact. But how safe is it from rain? Well, that’s one of the few things that I don’t really like about the ACAM-1000. 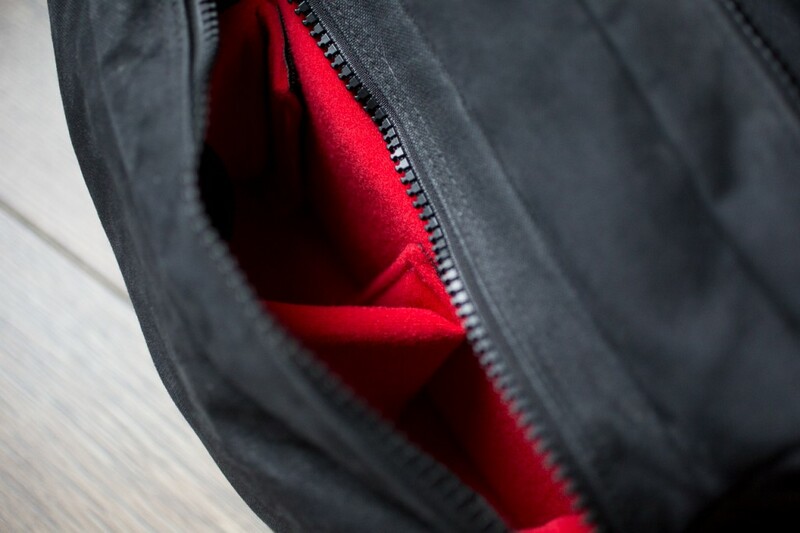 In the middle of both compartments runs a big zipper, which is not protected by anything inside, or outside the zip. And that’s where you find the biggest difference with Billingham bags. The bags from this British manufacturer are simply a better choice in wet and dusty environments. The ACAM-1000 filled with gear. The ACAM-1000 wears quite comfortably. Contrary to the Billingham bags, the A&A has a fixed padding on the shoulder strap and I think that’s a good thing. At least it doesn’t move while wearing, something that often happens with bags with a removable shoulder pad. The pad is thick enough, unless you put two Noctiluxes in the bag and walk around with it all day. The ACAM-1000 also has a short strap that you can use to pick it up. It would be nice if this short strap would be usable as a strap to fixate the bag to your waist while walking or biking, but that’s just a detail. So who’s it for? Anyone that wants superb accessibility to their rangefinder lenses, but without the need for a lot of extra ‘non-photographical’ storage and more than average weather protection. 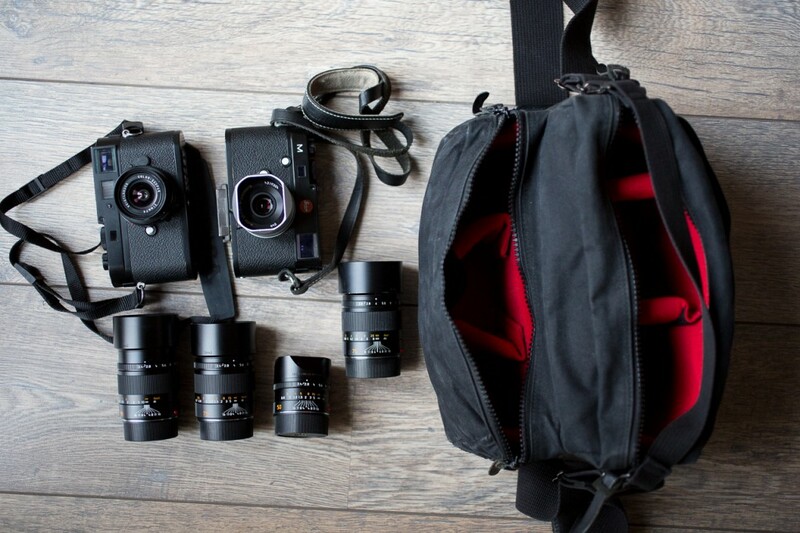 All this fits easily in the bag and more important: without the annoying stacking of lenses.